Wilmingon, DE (April 17, 2017)—While the hotbeds of heartworm disease haven’t changed dramatically in the past three years, the incidence numbers reported by participants in the 2016 American Heartworm Society (AHS) Incidence Survey indicate that the average number of positive cases per veterinary clinic has been inching upwards. The AHS announced its latest survey data, along with unveiling a new heartworm incidence map based on data from veterinary practices and shelters across the country. Of respondents participating in the AHS survey, 23.3 percent reported seeing more heartworm cases in 2016 vs. 2013, while 19.8 percent reported a decline in their practice areas. No state in the U.S. is heartworm-free, according to the AHS survey, which revealed the top five states in heartworm incidence were Mississippi, Louisiana, Arkansas, Texas and Tennessee—all states that have been in the top tier since the AHS began tracking incidence data in 2001. Rounding out the top ten states were South Carolina, Georgia, North Carolina, Alabama and Florida. Among the top ten, only Alabama, Louisiana and Texas saw decreases in the per-practice averages of dogs diagnosed, while increases were noted in the other seven. On a more hopeful note, reducing heartworm incidence is clearly in the hands of veterinarians and pet owners. Among veterinarians who reported a drop in heartworm incidence since the 2013 survey, 64 percent attributed the change to owner behavior, including increased usage of heartworm preventives and improved owner compliance. Veterinarians who reported incidence increases agreed; almost half (47.8 percent) cited failure to give preventives, skipping doses or failing to give preventives year-round as contributing factors. 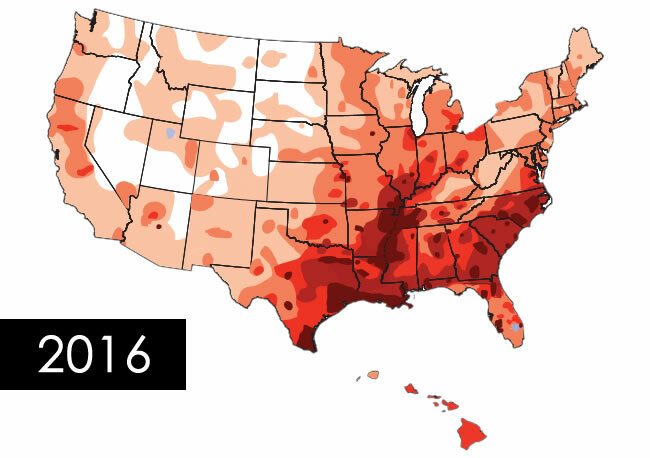 Other factors believed to contribute to incidence increases in certain regions were weather conditions conducive to heartworm transmission in 2016 and the movement of infected dogs into practice areas. Insufficient efficacy of heartworm preventives was only considered a factor by 3.3 percent of those veterinarians who saw incidence rise. According to the AHS survey, 77 percent of veterinarians reported that they follow the AHS guidelines on prevention, diagnosis and treatment of heartworm disease, while roughly half of practitioners utilize resources on the AHS website. “At AHS, our goal is to educate veterinarians, shelter personnel and pet and owners, and to be a resource to veterinary professionals who are committed to reducing heartworm incidence,” Rehm concludes.